Young Dandenong and Doveton job-seekers can take a step towards employment in March. The non-profit Skilling Australia Foundation is running its next APepTite Youth Job Ready Program in the area from Monday 5 March. The William Buckland Foundation-sponsored free program aims to develop employability skills in young people and then support their transition into a meaningful career. Sipusi Galu attended the APpeTite Hume program last year. She finished Year 12 at the Batman Kangan Institute, wanted a career in hospitality but struggled to find employment due to her lack of experience. While unemployed she discovered an interest in youth work which led her to APpeTitE. 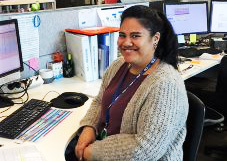 “I wasn’t sure what a traineeship was until I did the APpeTitE program,” Ms Galu said. The APpeTitE program helped me gain knowledge as to how to create a career pathway. 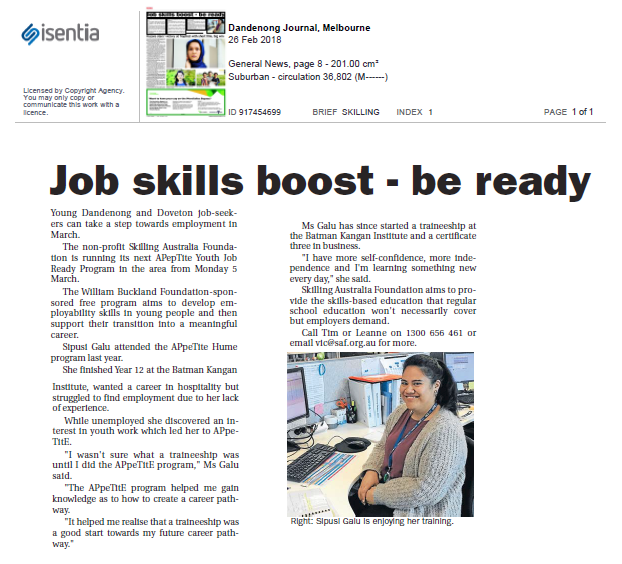 Ms Galu has since started a traineeship at the Batman Kangan Institute and a certificate three in business. “I have more self-confidence, more independence and I’m learning something new every day,” she said. Skilling Australia Foundation aims to provide the skills-based education that regular school education won’t necessarily cover but employers demand. Call Tim or Leanne on 1300 656 461 or email vic@saf.org.au for more information.